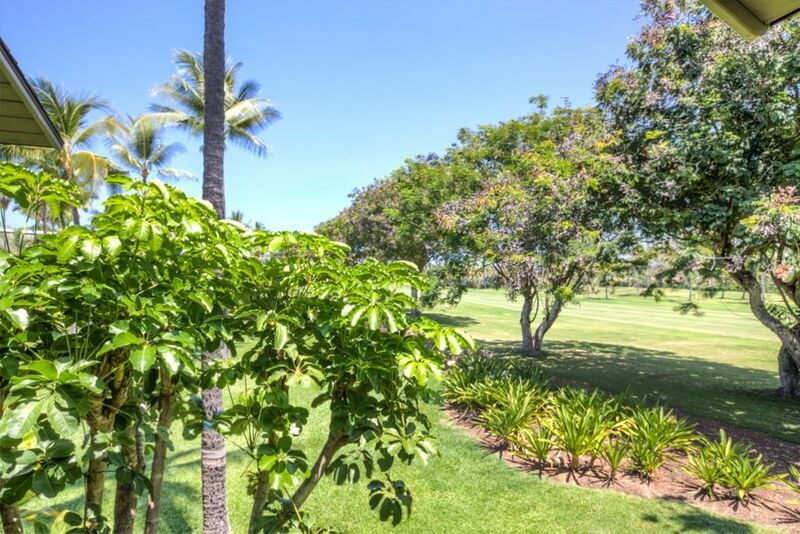 Prime fairway front location - great for bird watching or watching golfers along the 11th fairway of the Kona Country Club Ocean Course. Peaceful and spacious with lovely Hawaiian decor, this condo is the perfect escape for two couples or a family. Top Floor Condo with Vaulted Ceilings. Fully Equipped Kitchen with Everything. Comfortable Living Rm with Recliner, Flat Screen TV, Blu-ray Disk, Free WiFi. Comfortable Bedding with Sleep Number Bed in Master. Parking - Free - Some overflow parking available too. Kitchen - Full - Service for 6 persons. We really enjoyed hanging out at your Condo especially on the back lanai looking out over the golf course. Your condo is very well organized with easy to read and clear instructions. It was a very relaxing place to spend our spring break! Spacious and clean condo, accommodating and responsive owners! Over the years my husband and I have learned that you get what you pay for when it comes to vacation rentals and we definitely got what we paid for and more with this wonderful condo! There is lots of space in the condo, the kitchen was well stocked with kitchen gear, and there were instructions for everything in the condo. The condo owners were very responsive and accommodating! We were traveling with a two year old and they made sure to give us baby gates and asked if we needed any other baby gear such as high chairs. The condo is located just far enough south that we didn’t have to deal with downtown Kona traffic but close enough that it was a very short drive to all the restaurants and shopping. There is a grocery store and restaurants with in a couple minute drive of the condo as well which was very convenient. When our flight to the island was cancelled, the owner even offered to extend our stay on the other end to make up for the lost day. I highly recommended this rental if you are looking to truly have a relaxing and worry free vacation! We loved our stay at Kanaloa 203. Comfortable and nicely furnished with plenty of space for 4 adult family members. Kitchen had what we needed to prepare meals. Loved the evenings on the lanai - dining and playing cards. Enjoyed the amenities - we went swimming in the pools, played tennis and ping pong, and used the snorkel equipment and chairs on our beach days. Keauhou is a nice quiet location not far from the busy town of Kona and convenient to explore many areas of the coast. This well cared for accommodation is highly recommended! We stayed 10 days in November and had an excellent stay. The owners were great with communication. The beds were comfortable, AC very handy, and having a full kitchen was great. We loved the condo. Enjoyed watching golfers on the course. People were friendly and the pool was great. We will definitely stay with you again. Thank you for letting Mark and I enjoy your condo. We needed a last minute booking because of a family situation, and this condo was available. We couldn't have found a better place for our stay. It is clean, beautifully furnished, well stocked and has a lovely peaceful view of the golf course. We were very happy to have air conditioning, as it was very not and humid while we were there. We haven't seen Kona as clear and pristine as it is right now for quite a while. No vog or haze since the volcano has stopped. We decided to extend our time and everyone made it as smooth as it possibly could have been. Immediate response from property manager and owners.. I can't recommend enough and I am VERY picky!